In early November Intel officially announced that it was producing a new 8th generation Core processor including custom GPU cores supplied by AMD and on board HBM2 memory. Using a multi-chip-module (MCM) construction, and leveraging the Intel Embedded Multi-Die Interconnect Bridge (EMIB), would mean thinner than ever SoCs with processor, discrete graphics chip, and dedicated graphics memory working synergistically. Unfortunately further tech details were scarce, with tech enthusiasts being told we had to wait until Q1 2018 (CES 2018, we hope) for the full details. However, a couple of days later a ‘Kaby Lake G’ processor, matching the appearance of the MCM chip was photographed installed on an Intel NUC motherboard. Now, thanks to a slip-up by Intel India, we have some solid hardware specs for one of the first ‘Kaby Lake G’ processors, the Intel Core i7-8809G. The processor in question was listed in a comparison table of Intel Overclockable processors here but has since been removed. As Anandtech reports, the specs revealed confirm a number of important things. First of all with its 4C/8T configuration, Intel HD Graphics 620 IGP, and memory support up to DDR4-2400, this 'G' series processor is all but confirmed to be a Kaby Lake based chip. Secondly, the listing confirms the Vega architecture is behind the AMD GPU within this SoC - but the meaning of 'GH' is not known. 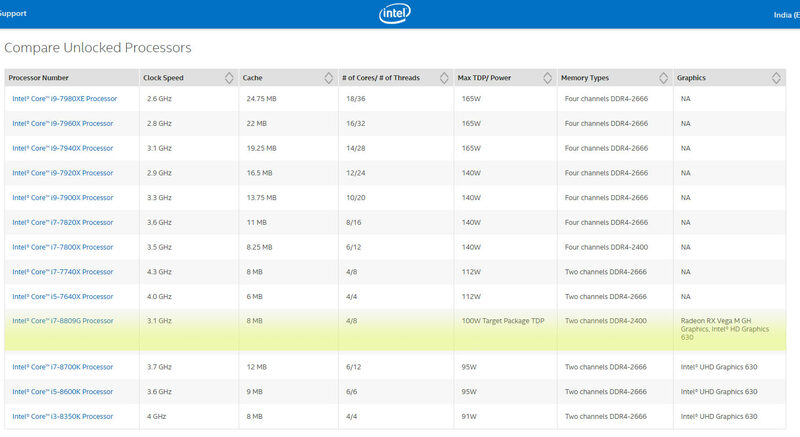 Another interesting thing is how Intel describes the processor TDP as a '100W Target Package'. Anandtech calculates that with the CPU portion of the SoC consuming about 45W, the GPU would account for 55W - enough for a 20-24CU Vega design. In its initial announcement of the AMD GPU partnership Intel hinted heavily at these designs coming to mobile platforms. However, the now removed listing was amongst Socketable Desktop Processors, raising hope that this processor model could be a drop-in solution to some existing desktop motherboards. CES 2018 officially starts a week today but there will be quite a lot of pre-show announcements and events. Some products containing ‘Kaby Lake G’ processors might be launched (like this one from HP) at the event. However, the now removed listing was amongst Socketable Desktop Processors, raising hope that this processor model could be a drop-in solution to some existing desktop motherboards. This is Intel we are talking about, IF (a big if) this ever sees the light of day as a socketable CPU this will of course require a new motherboard (with a new chipset) regardless of whether it needed to or not! Looking at the images show, I'd be amazed if it fit in the normal intel package. Also, not a kaby lake refresh part? I can't see any reason you'd use a non-refreshed chip, the refresh models available now have lower TDP by ~30W (at the expense of base clock speed, but who cares?) and the (probably smaller) UHD 620 IGP (with vega, the fact that the CPU die is smaller is only a plus). Intel is also joining the bandwagon of ‘LEAK’…….marketing in other terms. The only meaningful difference between Kaby and Kaby R is the capability of the IGP to decode 4k content. And there's no way of knowing whether that's down to an actual difference in silicon, or just some more meaningless product segmentation by Intel. Either way, I'm pretty sure Vega has 4k decode capabilities, so if Kaby R is different silicon, or if it's binned differently based on the quality of the fixed-function hardware (is that even possible??! ), there'd be no advantage to using Kaby R silicon/binning here. Given this is clearly meant to be a gaming oriented part it would make no sense to restrict the CPU section to a 15W TDP, although I suspect that CPU TDP is rather nebulous as one of the capabilities of EMIB is to redistribute TDP allocation based on load - so on games with low CPU load and high GPU demands you should find the CPU clocking down to allow the GPU to use more of the TDP.